Several readers emailed about last week’s EPtalk, where I shared my frustration with CMS and the constantly-changing game of Meaningful Use. I’m sorry for how you feel about CMS and long for days of old when $5 got you a doctor visit at home. I’m 76 and have been on Medicare for over a decade. From a patient viewpoint, it beats big payers hands down. One little card with a red, white, and blue stripe gets you everything from any healthcare system, any physician, no referrals, no one ever asks a question, and, if you have a gap insurer, you almost never pay a nickel. As I recall, CMS gave every doctor $44,000 to buy an EMR and every hospital a lot more. I’m sure over $50 billion was given to providers and now CMS wants something in return. Sounds reasonable to me and almost rare that the government can’t be accused of a giveaway. I think a lot of MU requirements are off target as to need and value. Most EMRs are off the mark in architecture, workflow, and value. So, we have the equivalent of a 1.0 standoff, but at least it is a start. Hopefully by 2.0 both the MU and EMR will have both evolved to a better place. This will take at least a decade and the practice of medicine and the technological advancements during this period will make the current systems look like stone age work. Don’t give up on Medicare and CMS; make it better. The alternatives are much less attractive. Speaking as an Eligible Provider, I can confidently state that CMS hasn’t “given” us anything. It’s true that up to $44,000 each was available to eligible providers over a multi-year period. For most providers in my community, however, it cost far more than $44,000 to dot the “I” and cross the “T” of each Meaningful Use requirement. Even in the first iteration of Stage 1, providers had to meet 22 objectives (several of which have multiple subcomponents). For many physicians, this meant overhauling practice operations. Unfortunately, I’ve seen a lot of box-checking at the expense of clinical quality. When providers go to file their attestation, it’s all or none in nature, which creates a great deal of stress on caregivers and staff. I’m glad you have had such a positive experience with Medicare. Patients in my community aren’t as fortunate, as many physicians have stopped accepting Medicare assignment or are limiting the number of Medicare patients they see. CMS has many coverage and medical necessity rules and my patients are spending a lot more out of pocket than some of them think is fair. We’re still in a recession and quite a few patients have been forced to drop their supplement plans or have chosen barebones coverage that they don’t like. Those who have gone on Medicare Advantage plans hate the narrow networks and further limitations, but like the cost. Speaking of cost, going back to what it costs to implement an EHR. Looking at HealthIT.gov for numbers, they list the five-year total cost of ownership (estimated average) as $48,000 for an in-office system and $58,000 in a software as a service model. That doesn’t include practice losses during implementation or ongoing loss of efficiency, the need to add additional staff to manage all the metrics, or hiring contractors and attending classes just to make sure one understands all the maze of rules. I agree with you that necessary change will take a decade. Unfortunately, CMS only gave providers half that time to accomplish ever-changing (and sometimes obscure) goals involving elements beyond their control before the penalties kick in. I hope there are some primary care providers left when the dust settles. I’m seeing my peers retire in droves and there aren’t enough new hires to fill the gaps, increasing patient wait times. What do I think? Well, I’m glad you asked. I have just spent about four hours reading, digesting, and summarizing in a document I can share internally what this could mean. Then again, it might not mean any of what I have summarized. Theoretically depends on public comments. This has been such a frustrating process for everyone. I work with providers and healthcare organizations. There was so much confusion with the 2014 CEHRT requirement already. This will undoubtedly make it so much worse. For some EPs, it could be a life preserver – several vendors aren’t CEHRT yet. Maybe the 62-year-old provider I met with last week (whose EHR vendor wants him to sign a 10-year contract for their patient portal) will be able to delay and shop some more. Perhaps another client I work with won’t be forced to purchase a CQM module and sign a three-year contract by June 1 or be faced with missing MU Stage 2 this year because the vendor won’t have them upgraded in time. Waiting the 60 days for public comment, however, will be like trying to fly stand-by the Wednesday before Thanksgiving. If you get the flight, all will be well and you’ll spend the day smiling and toasting your good fortunes. If you don’t, you had better be scrambling to figure out how to thaw a turkey overnight. MU and a turkey – it’s a good analogy! Thanks for writing. Your thoughts reflect those of many people I’ve spoken with this week. The potential delay doesn’t mean anything if it doesn’t go through. If you wait for the final rule and you didn’t guess right about its content, you’re going to be caught short. In the mean time, everyone has to push forward as if there will be no delay. I really like your turkey analogy. In contrast to CMS, however, Butterball has a turkey hotline you can call for actual answers. I’m not sure how many readers we will have given the Memorial Day observance. I hope you were able to spend time with loved ones and took the opportunity to remember those in the armed forces that made the ultimate sacrifice. If you’re wondering about today’s picture, it’s courtesy of Smithsonian.com and was taken at the site of the Battle of the Somme. 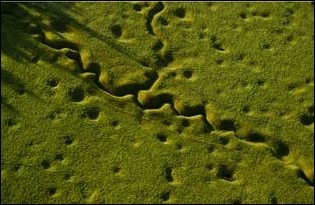 There are several other haunting images that show the scars that remain even after 100 years.